There are a number of ways in which pupils voice has an authentic position in the school's strategic school improvement. 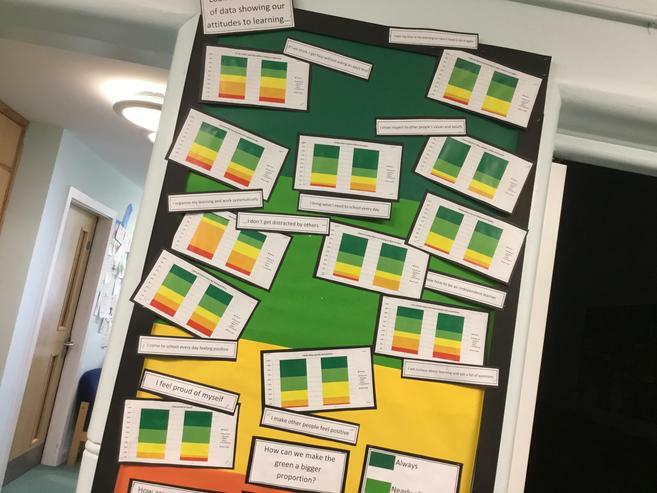 There are a number of peer-led opportunities and children have a significant involvement in decision making and using responses from pupil questionnaires to decide on how to design particular learning activities. - The school council, under many different names, are regularly involved in leading forward themed weeks. The Wellbeing Council les a whole school assembly to introduce Healthy Body Healthy Mind week. - The school council is also involved in key school improvement activities and take on a key role in setting priorities and responding to evidence from monitoring. 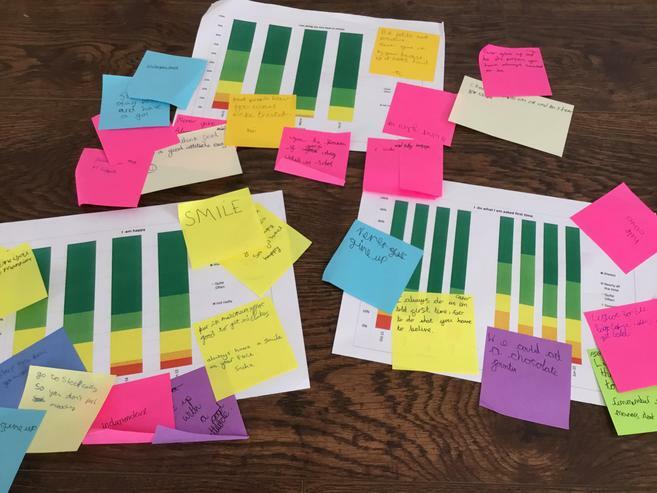 There is a photo attached showing evidence of how the school council has engaged in coming up with ideas for how to respond to data from the pupil questionnaires . 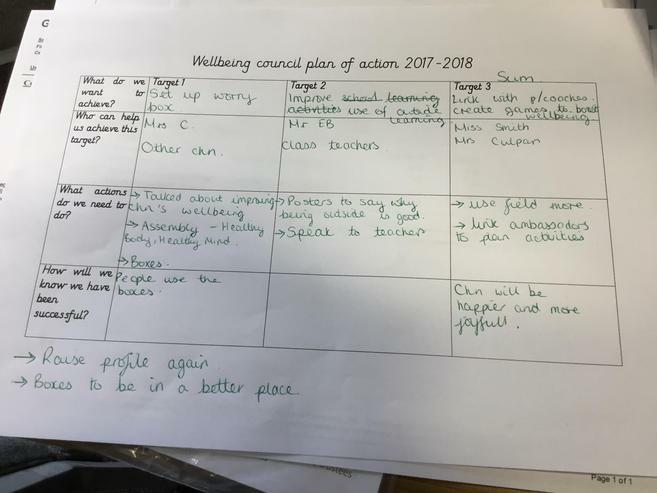 This year, the school council is known as the Wellbeing Council. 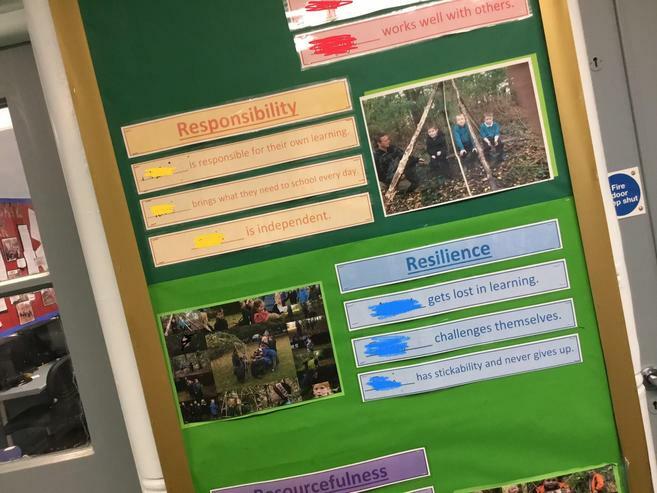 A photo attached shows evidence of how they have been involved in setting up targets as part of their work and how they have reviewed them across the year. - Pupils are trained as peer mentors for other children - proforma attached for them to complete. These discussions are set up when there is a concern over a child's behaviour and they need some intervention to support them emotionally. - Children are encouraged to nominate their peers who they notice show positive emotions. Certificates are then presented by the children to other children in the weekly achievement assembly. - The school council regularly go on learning walks around the school looking for children showing good learning behaviour including the 5Rs. Those that are spotted are then recorded on a display in the school corridor. The children love being part of this display and will regularly check themselves if their name has been chosen.